Many Light Workers reject the physical body; reject the physical life, seeing financial wealth as a root of evil. Seeing living a blissful life as an easy life, one that would perhaps distract them from the journey into the spiritual realms. “This is part of breaking out of the old paradigm where old paradigm consciousness believed that if you sacrifice your entire life you are considered to be saintly. You are considered to be worthy of God’s Love. This is no longer a part of this “New Reality of New Age”. You see, Beloved Ones, you have to move away from the old paradigm of thinking and creating. You are living in a modern world but what has happened is that humanity’s consciousness has chosen to come through you re-creating all the old ways of being, re-hashing all the old systems. In PAPER 62 has been stated: ‘The “body” of God’s Universe Supreme is in it-Self a giant macro-holographic vortex of purposeful energy of unified intelligent Self stemming from the Paradise center. The Universe and all of its Creations and Evolutions of time and space are therefore of the Intelligent Design and so are you as the solar micro-holographic vortex of actualizing Supreme’s time-space potentials. 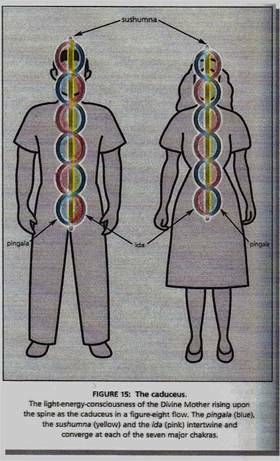 Male and Female vortex PUMA-selves, evolved from the Male and Female central ego-centric vortex PUMAs, have their DOMINANT energy charges and polarities as illustrated below. Male and Female vortex energy DOMINANT and RECESSIVE CHARGES and POLARITIES are presented below. 10 B image of the lowest chakras is the clairvoyant “upload from below”. The above chakra images actually present the vortex interference planes of their respective upper and lower sub-vortex halves. The 3D image of this 1st base or root Female chakra/vortex interference 10 B disc/plane with its upper and lower F-M sub-half vortexes would appear as presented in the Picture 11 below. With the formation of the Physical UltiMate Atomic (PUMA) vortices, their indwelling forces bring many of spin combinations of ultimate atoms into play mainly through their forces of attraction or repulsion within surrounding undifferentiated space forming walls of separation of each combination of sub-group or aggregate formed.